There is nothing like seeing things with your own two eyes. We use our eyes every day, every moment that we are awake, yet we often don’t think about them. Given our significant reliance upon them, though, it’s important that we give proper attention to protecting and preserving their health. The eyes are the second most complex organ in the body, behind only the brain. In fact, they have over two million working parts. And while the eyes are excellent at maintaining themselves, working efficiently to filter out dust and dirt and heal scratches, they can’t do it alone. 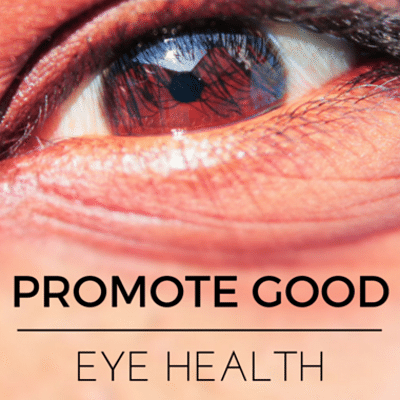 So what can we be doing to make sure our eyes stay healthy and functioning properly? Obviously, it goes without saying that having a regular eye exam is a great start to maintaining your healthy vision. Not only are eye care physicians able to assess the functioning of your vision, but they are able to get a close up look of the eye during these routine exams to search for early indications of disease development which don’t often present any overtly detectable warning signs. Of course, like with any other topic of health, the correct course always includes a healthy, well balanced diet. Your eyes rely on vital vitamins and nutrients to function properly, and our diets are the best sources of these. Ensuring you eat plenty of green leafy vegetables, citrusy fruits, fatty fish such as salmon, and nonmeat protein sources like eggs and nuts will give you a great foundation of those nutrients. Additionally, eating healthy and staying active maintains a proper body weight, helping to protect against diabetes, which can wreak havoc on the eyes. Included in this healthy diet approach is the avoidance of smoking. Smoke can have detrimental effects on the entire body, and the eyes are no exception, as it can lead to issues such as cataracts and macular degeneration, both of which can lead to blindness. Protecting your eyes from harmful external factors is an important step as well. Wearing proper safety wear when playing sports or working on projects at home or work is a start. But more commonly, the external factor that can do the most damage is the sun and its ultraviolet rays. These rays can lead to macular degeneration and cataracts. Therefore, wearing sunglasses is not just a fashion statement, but a way to preserve your eye health. Pay close attention when buying sunglasses and ensure your pair blocks 99% to 100% of both UV-A and UV-B radiation. Given our reliance today on computers, tablets, and phones, screen time has become a significant contributing factor to eye strain. When looking at screens, we often tend to blink less than we would otherwise, which is why we often experience eye strain, headaches, or trouble focusing after spending extended periods working on our electronics. To combat this, the obvious remedy is to make an effort to blink more often. Additionally, you can take advantage of the 20-20-20 rule. It states that when working at a screen, every twenty minutes, look away at something roughly twenty feet from you for twenty seconds. This will give your eyes a chance to rest and reduce fatigue. In the medication and supplement realm, there are many beneficial products that can help to improve current issues you might be having, as well as to prevent issues from occurring in the first place. From a medication standpoint, over the counter, there are a variety of topical products that can help with dry eye, allergic inflammation and more. From a prescription standpoint, your doctor can prescribe even stronger options to handle these conditions as well as others such as infections, dilation issues, and glaucoma. On the supplement side of things, taking a supplement that combines eye healthy vitamins and nutrients is a great option for both prevention and maintenance of eye related conditions, especially for those who may not have the perfectly balanced diet. An example of such a product would include vitamins, minerals, and antioxidants that have a synergistic effect, protecting the eyes in multiple ways. For example, carotenoids such as Vitamin A, lutein, and zeaxanthin protect the macula and retina of the eyes, guarding against macular degeneration. Minerals like zinc and selenium also protect the macula and in addition, can both prevent and retard the progression of cataracts by increasing the body’s production of antioxidants that protect the lenses of the eye. Additional antioxidants like glutathione and alpha lipoic acid further enhance this protection. Vitamins like A, C, and E, can strengthen the retinas, combat dry eye, and protect the macula. Keeping with the supplement theme, omega-3 fatty acids also play an integral role in the health of the eye. Omega-3’s have evidence to support their use in the prevention of age-related macular degeneration, the treatment of dry eye, and they may help to improve the condition of glaucoma patients. Additionally, omega-3’s play a role in converting the light transmitted to our retinas into nerve signals which eventually results in our sight. For the most part, many of us are deficient in omega-3’s given the western diet doesn’t emphasize the consumption of fatty fish such as salmon at least twice weekly. Consuming a quality, highly concentrated omega-3 supplement that contains the active omega-3’s EPA and DHA in sufficient quantities is a great way to fill the gaps within your diet. It’s important when purchasing supplements for eye health, or any other condition, to consult with your pharmacist, or physician, to ensure you are buying a quality product with the right ingredients. Seek out a store that specializes in these types of products so you can ensure their quality. Pharmacies such a Pine Pharmacy in Williamsville are a great resource in this realm. Taking the steps listed above can be a great start to preserving and maintaining your vision. We rely on our eyes for nearly every aspect of our lives, so be sure to take care of yours.